Dr. Eric Bekemeier brings his passion for primary care to CVMG. Originally from Detroit, Michigan, Dr. Bekemeier attended Michigan State University where he obtained a Bachelor’s Degree in Human Biology and a love for Spartan football. From there he moved to California to start his medical school training at Touro University College of Osteopathic Medicine in the San Francisco area. Dr. Bekemeier met his wife, our fellow physician, Dr. Kimberly Bekemeier in San Francisco and they subsequently moved to the Southern California area to start residency training. He trained at Pomona Valley Hospital Medical Center-UCLA, obtaining his Family Medicine Residency degree. 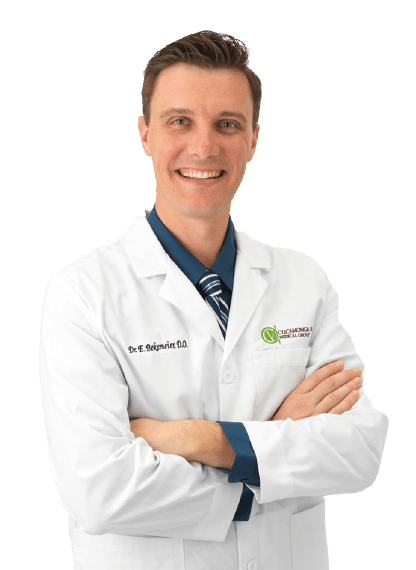 After beginning his practice in the High Desert, Dr. Bekemeier joined CVMG to help you and your family. He cares for patients of all ages, from birth onwards, and can help you manage all your basic health needs from the common cold to your chronic diabetes. He is a father of 2 young boys and enjoys outdoor activities with his family as a way to maintain health.